Small Panda has lost his bottom. It was there when he went to sleep but now it has disappeared. He searches high and low, and finds stripy bums, pink butts, feathery derrieres. 'Are you my bottom?' 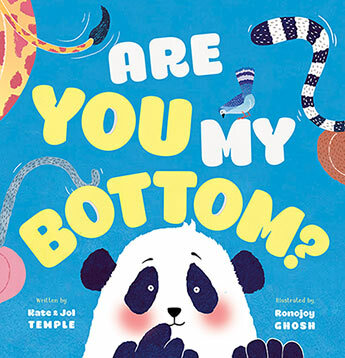 he asks, but none of these bottoms are his. Finally, he spots a furry bum which just has to be his - but the answer is surprising! A cheeky story for anyone who has ever left something behind. Kate and Jol Temple have numerous children's books to their names including Captain Jimmy Cook Discovers Third Grade and their picture books Parrot Carrot, Mike I Don't Like and I Got This Hat which was selected for National Simultaneous Storytime in 2016. These books have managed to find themselves on short lists and NSW Premier's Reading Lists. They have also created two digital adaptations of their picture books for which they have received international awards for creativity. Ronojoy Ghosh has been in the advertising industry for the past 18 years, which has included stints in India, Indonesia, Singapore and New Zealand. He currently lives in Australia with his wife and son. His work has been recognised with many advertising awards including a Gold at Cannes. Beyond advertising though his passion lies in writing and illustrating children's picture books. His first book Ollie and the Wind was shortlisted for the CBC Book of the Year Award and second book, No Place Like Home, has been published around the world including Germany, Spain and Korea.